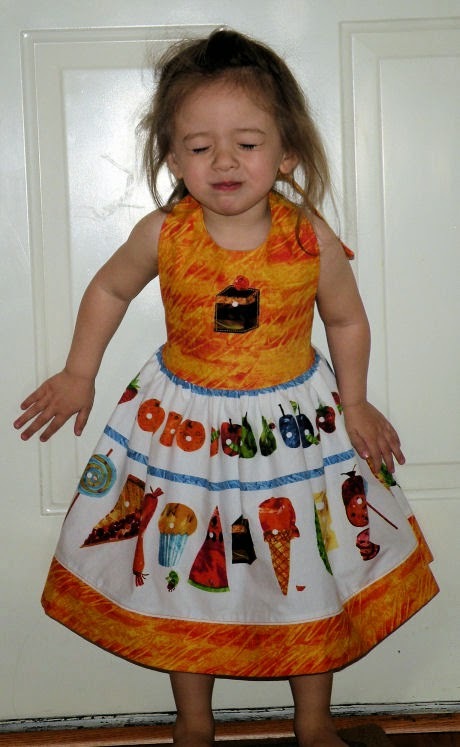 Almost a year ago, I made a dress for Miss M from some of the Very Hungry Caterpillar fabric put out by Andover Fabrics. I looked up the pictures I took of her modeling the dress and I can't believe how much smaller she was a year ago! I hadn't started this blog yet, so I thought I'd go ahead and share a picture of the dress from last March. The pattern is my own design, a simple tie-neck halter top and shirring in the back. 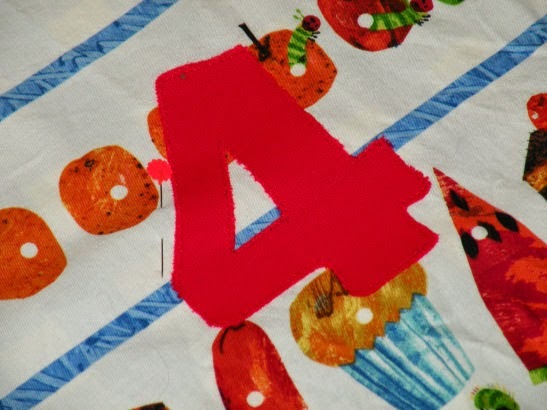 The reason I was thinking about this dress is that I'm using some of the remaining fabric for the indoor hopscotch game. It seems to be one of those projects that is never quite done despite my best efforts. Right now, it's all put together and pinned to the background fabric like some sort of freakishly large applique. Tomorrow I hope to get it sewn down. Now I'm off to slumberland. We've been going to bed early and watching BBC movies via Netflix on the laptop while snuggled up under mountains of blankets. What better way to end these bitter cold days? OMG I love that dress!!!!! Thanks! I was very pleased with how it turned out! We took her to have professional pictures taken in that dress with the Hungry Caterpillar stuffie and the book. They turned out so cute!